NO TAIZE EVENING PRAYER on Wednesday, April 17. Please join us for Holy Week services at 7pm Thursday, April 18, and 12pm & 7pm Friday, April 19. 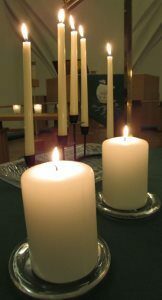 TAIZE SERVICES RESUME on Wednesday, May 15. 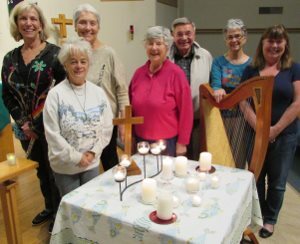 Worship leaders offer evocative music with flute, harp and voice during the Taizé-style service on the third Wednesday each month at PEACE Lutheran Church. Candlelight, periods of silence and music from harp and flute mark the Taizé-style evening prayer offered at 6:30 p.m. on the third Wednesday each month at PEACE Lutheran Church. Bible readings keep the focus on God’s word, offering peace to all people on earth. PEACE musicians lead the worship with music sung in harmony. Embrace the Mystery of God’s Love! Worship leaders offer evocative music with flute, harp and voice during Taizé Evening Prayers. The distinctiveness of Taizé is the simple songs that are repeated frequently. This short, simple prayer service leaves participants feeling lifted up and at peace. All are welcome, regardless of religious tradition or affiliation. Peace’s Taizé service coordinates with another Taizé-style worship offered at 6:30 p.m. on the first Wednesday of each month at Nevada City United Methodist Church. The Taizé community developed in the 1940s in the village of Taizé, in German-controlled France. Members helped Jewish refugees fleeing, ministered to prisoners of war and attended orphans, according to the Taizé community’s website. Swiss-born, Protestant founder Roger Schutz sought to form a community of men who would live simply and celibately, in service to God. “Ever since I was young, the intuition that a life of community could be a sign that God is love, and love alone, has never left me.” Taizé founder “Brother Roger” wrote these words on the community’s website before his death in 2005. Candles and music evoke an atmosphere of tranquil mystery during the Taizé-style evening prayer service, at 6:30 p.m. on the third Wednesday each month at PEACE Lutheran Church. The Taizé brothers’ message especially appeals to young people. They gather at the community in the tens of thousands, according to news reports. Music written for the prayer services has become popular in churches around the world. Silence forms a part of those services – but it can be uncomfortable for modern seekers accustomed to constant engagement. In PEACE’s Taizé-style worship, silence invites participants to deepen their engagement with God. PEACE Lutheran Church is at 828 W. Main St., Grass Valley, Calif. – near downtown. Learn more about PEACE here.